What a sad story is corn in America. Demonized now because of the commodification of agriculture and our reliance on feed corn, corn is viewed with a suspicious eye. As a naïve Midwesterner, I’ve always loved corn. I like popcorn, corn on the cob, cornnuts, cornbread, corn tortillas, corn salsa, tortilla chips, cornmeal, corn broth, corn chowder, corn stirfry…the list goes on. The only kind of corn I don’t like is canned creamed corn. Well, and high fructose corn syrup, which kind of starts out the same way. I realized after reading Pollan’s Omnivore’s Dilemma, like so many of us did, that corn was a huge part of my diet as an American. My very first diet seachange was to start cutting out preservatives and “hidden” sources of cheap corn in my food to shift my dollars away from Big Ag. So I laughed in sympathy when Ayers Creek Farm owner Anthony Boutard began his talk for our Oregon Agriculture panel at the Food Justice Conference last month by shaking ears of corn at the audience, saying how mad he was that Pollan had ruined corn. In 1922, McCall’s magazine ran an editorial on the introduction of new American fiction that would represent real, not nostalgic or idealized, American life…as American as corn. I believe (partly as an addled corn addict, partly as a Midwesterner, and partly as a huge fan of Boutard’s corn) that we should rehab the reputation of American corn…as American as fiction. We grow decent corn here in Oregon, believe it or not, and some of it is actually dried. Homemade hominy is the perfect opportunity to start corn’s renaissance efforts. I had the chance to make it last week, thanks to some red and yellow flint corn, already treated with hydrated lime, that Anthony brought down to Eugene for me. Above, you can see a picture of the results: both my not-quite-successful attempt to remove the pericarp coating the inner kernel and the awesome freezing power of my new chest freezer, which just added a tiny bit of frost atop the corn. 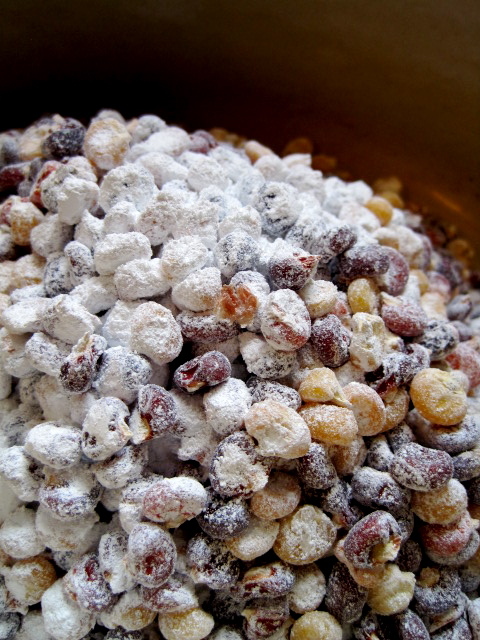 Hominy can be pressure-canned or frozen. I froze this batch because was a bit nervous about the stubborn clinging of the pericarp (the little nodule on the end is supposed to come off and didn’t, even with fierce rubbing) affecting the penetration of the heat in pressure canning, which sounds silly now that I type it. Freezing is a lot less hassle. My favorite use of hominy is what I call fake posole, a soup that isn’t even remotely like posole, save the pork and hominy. 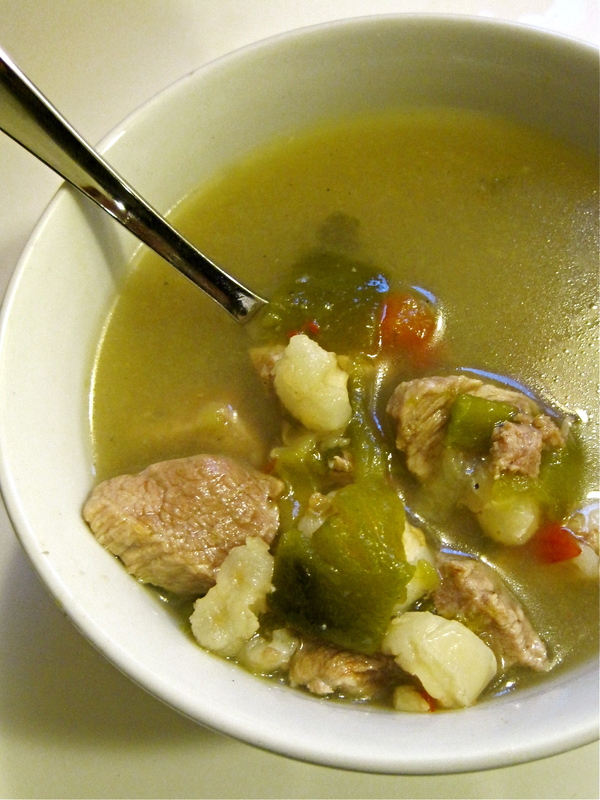 I particularly like the combination of green chiles and pork. In the soup pictured below, I simmered pork shoulder in a stock pot with onion, garlic, and bay leaf for a few hours, then shredded the meat and added some of my homemade salsa and a couple of cups of roasted chiles (frozen is fine) and the hominy. The difference in using fresh (or fresh-frozen) hominy is that what’s usually mainly a starchy texture in the can becomes the most delicious, nutty, roasted corn flavor when you make your own. It greatly enhances everything it touches, and I’ll never touch the canned stuff again. For example, check out the pure white, washed out kernels in the soup (made with canned hominy), and the brilliant yellow and red stuff above. The color differences, well, pale in comparison to the taste differences. To make your own hominy, you’ll need hydrated lime (calcium hydroxide), also known as pickling or slacked/slaked lime (Spanish: cal, if you want to search for it in a Hispanic market), to break down the outer pericarp on the kernels. I’ve also seen recipes from a very reliable source, the University of Georgia National Center for Home Food Preservation, that use lye (sodium hydroxide) or baking soda (sodium bicarbonate). Also, in the intervening years between writing this post and editing it, I should mention that Anthony has published a fantastic book on corn, really a must-have for the locavore gardener/cook. Expect science and recipes from renowned Portland chefs! Here are Anthony’s instructions, slightly edited for clarity. Enjoy! In an enamel pot (ed: important, since the lime is caustic and you don’t want it reacting with metal — I used my Le Creuset dutch oven and it cleaned up easily), add two tablespoons of hydrated lime per pound of corn. Add water to cover the kernels by an inch or so. Heat the pan to a bare simmer, don’t boil, and let cook for 40 minutes to an hour. The solution will turn a lurid yellow and the fragrance of corn will fill the kitchen. Take the pan off the heat and let the mixture steep overnight at room temperature or on the back stoop. The next day, strain off the lime and liquid into the compost bucket (ed: will add calcium to your compost). Rinse the kernels vigorously several times until they are clean. The outer skin of the kernel, the pericarp will wash away (ed: I stress VIGOROUSLY and SEVERAL, but don’t worry if you don’t get it all off, since it’s still tasty. I let it sit for two days and it was still hard to get the pericarp off). The result is alkalinized corn, or nixtamal. 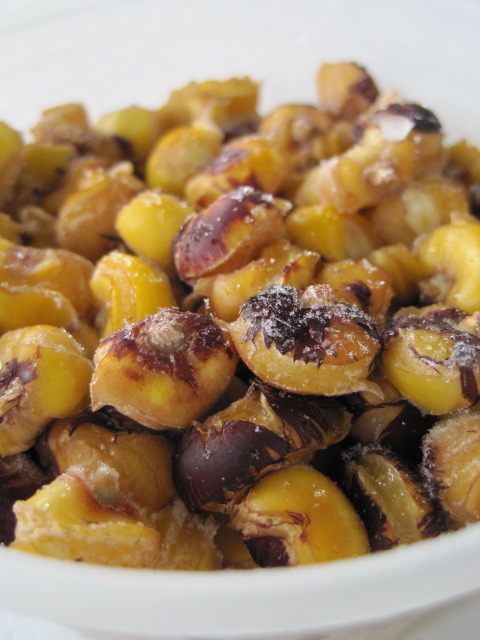 The nixtamal is cooked very slowly until it is tender, at which point it is called hominy. If you have a slow cooker, you can use it to cook the hominy (ed: highly recommended). Fill your stockpot or slow cooker pot with the corn and fresh water. Cover the kernels well, as they will absorb a good deal of water. Bring to a boil and then simmer until the kernels split open as little flowers. The hominy is now ready to use in a pozole or soup. This looks great, never though of making my own hominy before. Just stumbled across your blog randomly. I sang in Eugene a few years ago! Keep up the good work! If you didn’t want to use chemicals, you could do this just fine with wood ash. I’ve done it recently with wonderful results. You just have to soak the corn in water the day before, then boil with a half cup ash per pound of corn, then boil till the skins are loose, an hour or two. Run it under water to clean, which is kind of hard. Using wood ash is a bunch of chemicals – including the ones that do the hominy work. I use sodium bicarbonate AKA “baking soda”, and water as my alkaline solution for making hominy, instead of lime. I’ve done it many times with no failures. It works just fine and not as dangerous as lime. Use about 1/4 to 1/3 cup of baking soda with enough water for 1-2 pints of dry corn. Just follow the normal simmering and rinsing instructions as other recipes.